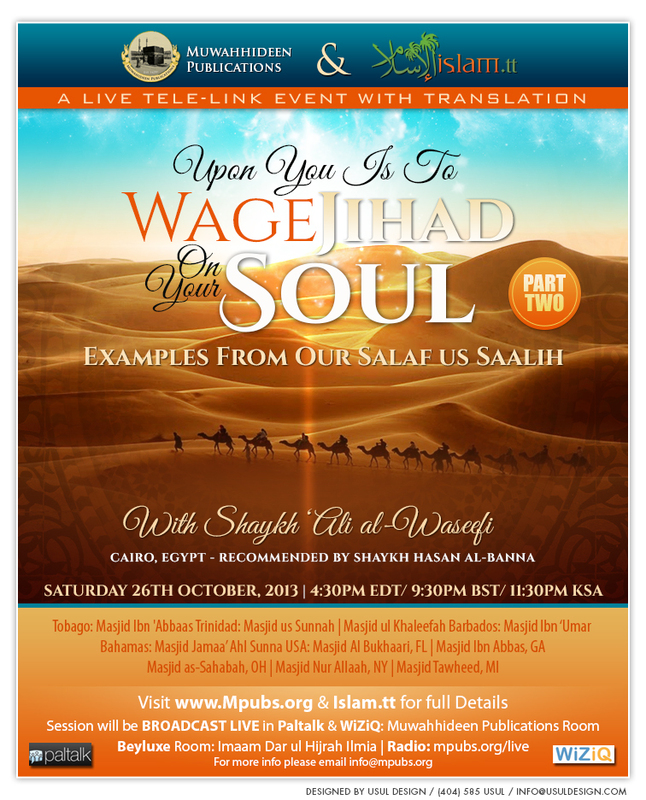 The Noble Shaykh ‘Ali al-Waseefi (May Allah Preserve Him) from the mashaayikh of Egypt will deliver part two of his heart felt tele-lecture with Muwahhideen Publications entitled “Upon You is to Wage Jihad On Your Soul” on Saturday 26th October 2013 this time, bringing examples from our Salaf-us-Saalih. The Shaykh is a student of Shaykh Hasan Ibn ‘AbdulWahhaab Marzuq al-Banna and is also recommended by him. When Shaykh Hasan was asked, “Who are (the mashaayikh) of Ahlus Sunnah in Egypt?” From the mashaayikh he mentioned by name was Shaykh ‘Ali al-Waseefi (May Allah Preserve them both).